When it crashes. When the wheels come off smack in the middle of the project—and you’re left dazed by the side of the road, staring at the smoking wreckage of your work. That happened with this book. Last Christmas, two years into it. I thought I was finished. I thought the book was done. I thought it was terrific. I gave it to a trusted colleague. He read it and hated it. Let me rephrase that: he HATED it. Hate, I can handle. The problem was, my friend was right. He pointed out a fundamental flaw in the concept of the book–and that flaw was fatal. I had no idea how to fix it. I didn’t think it could be fixed. I panicked. I lost all perspective. I forgot that I had written The War of Art. I forgot that I had read The War of Art. I freaked. I went into an emotional tailspin that took months to pull out of. The battle came. The two phalanxes locked up, shield against shield, in the center of the battlefield. Both sides were heaving and pushing, seeking to gain the advantage. Epaminondas watched and waited. Endless minutes passed. The warriors’ legs were cramping, their knees gave out, but still both sides shoved and strained against each other, trying to break their opponent’s will. Finally the moment of supreme exhaustion came. Epaminondas sounded the trumpet. His warriors remembered their promise of the night before; they summoned their final reserves of strength and pushed back the Spartans just one foot. That did it. The enemy ranks broke. The battle was won. The point of the story is that each of us, as artistic and entrepreneurial warriors, must wade into battle knowing that the moment will come when total defeat is staring us in the face. It happens on every project. A movie, a record album, a new business, a philanthropic enterprise … at some point our funding will vanish, our star will run off to Argentina, our software will crash, the whole shooting match will go up in flames. On The Profession I forgot. I wasn’t ready. When the fatal moment came, it was the enemy who was pushing me back. I was the one throwing away my spear and shield and running for the hills. The Marines have a mantra for moments like this: “Work the problem.” I was too flipped to do that. I couldn’t take my own advice. I acted like an amateur, not a pro. I forgot everything. The Profession is set in the future. But I hadn’t set it far enough into the future. The story happened only ten years out. The result was that events in the narrative were too close to current; they touched too many immediate political and emotional nerves. The too-near time period made it impossible for the reader to willingly suspend disbelief. The story read like a polemic, not like a page-turning yarn. The answer was to move the story out another ten or twelve years. I picked the year 2032. At one stroke, this solved all problems. The events of the story were now distant enough to establish and maintain their own integrity. I could write about the third Iran-Iraq War; I could describe the Emergency Powers Act of 2024. The reader could willingly suspend disbelief; he wasn’t being constantly called to mentally fact-check or to defend his own political point of view circa 2011. So: back to the drawing board. Three-fifths of the story went into the trash; two-fifths could be salvaged and reconfigured. It took nine months to write the new stuff. The Profession became the hardest book I’ve ever written. It really took me to the edge. Will it surprise you when I report that the book crashed a second time, six months later? Crash #2 was easier to handle. This time I remembered Epaminondas’s trumpet. What’s the moral of this tale? 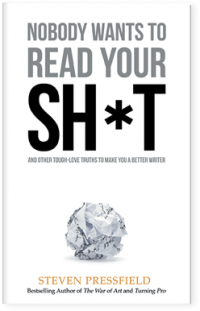 It’s this: if anyone reading this post is tempted to look up to me, for whatever reason, and to imagine that I’ve somehow got this writing thing wired … please disabuse yourself of that notion. All of us, I don’t care who we are, are gonna crash. It’s the nature of the beast. My wish for you is that you panic less than I did—and that you work the problem more. Start with this War of Art [27-minute] mini-course. It's free. The course's five audio lessons will ground you in the principles and characteristics of the artist's inner battle. Continue each week (also free) with our Writing Wednesdays and What It Takes posts, each one like a new chapter in The War of Art. Plus continual videos, freebies, specials and new material throughout the year. Steve shows you the predictable Resistance points that every writer hits in a work-in-progress and then shows you how to deal with each one of these sticking points. 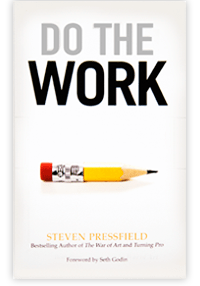 This book shows you how to keep going with your work. I already have a copy. 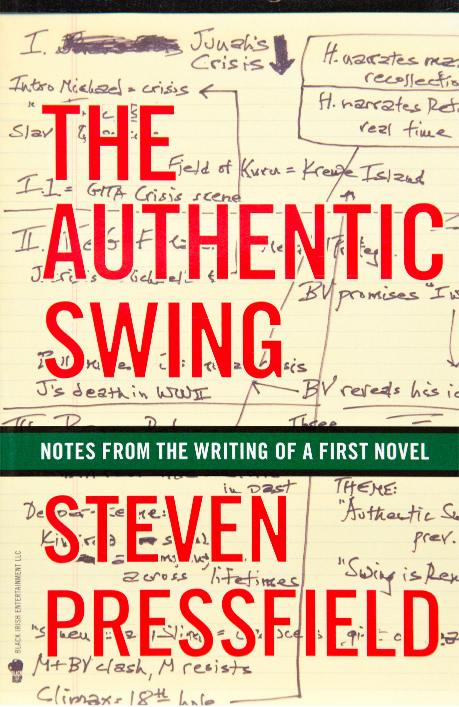 A short book about the writing of a first novel: for Steve, The Legend of Bagger Vance. Having failed with three earlier attempts at novels, here's how Steve finally succeeded. Steve shares his "lessons learned" from the trenches of the five different writing careers—advertising, screenwriting, fiction, nonfiction, and self-help. This is tradecraft. An MFA in Writing in 197 pages. Amateurs have amateur habits. Pros have pro habits. 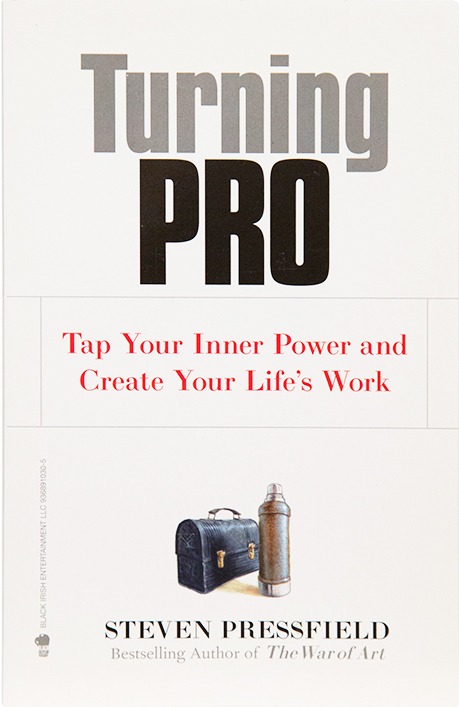 When we turn pro, we give up the comfortable life but we find our power. Steve answers the question, "How do we overcome Resistance?" Get a new mini-book from Steve every single month. One common thread I’m noticing here, more from my personal tailspin (longer than yours, Mr. P.) than from your book, is that a panic mode pulls the concentration off the problem and onto myself. It’s all, “What am *I* going to do? How will *I* survive this? How could this happen to *me*?” It’s a defensive posture, hardwired into us all. But the solution begins when I take the effort to push the spotlight off myself and back onto the problem. Putting my situation onto a mental back-burner, first, helped me feel better and stopped that negative feedback loop, and second, let me imagine a solution. I’m not saying anything you don’t know, Mr. P. I’m just saying it differently. And not just from reading your book, but verified by recent experience. YES! There is a big difference between being self-absorbed and being absorbed in your work. It has taken me years to see and feel the difference. this post of yours, mr. pressfield, makes me want to say just one thing: i love you. ok, two things: thank you for this. all right, three things: i hear the trumpet loud and clear, right now – today! I really needed to read this today. I’m trying to fund-raise money to study art in France next year. Looking at my finances today, it looked like everything was about to fall apart. This reminded me that all it means is it’s time to push back. I needed that one today. Thank you! Stephen: wonderful post as always – what’s the source of your Epaminondas vignette? I use Leuctra as an example often in writing and in speaking, although in a slightly different framing. The “tactical shift” – both in his thinking and in his deployment – at Leuctra, putting his Sacred Band as “the tip of the spear” at the head of a 50 deep phalanx on the wrong (left!) side. Your trumpet story is another fascinating bit of this almost forgotten history. Its always better to SEE the answer than just to LOOK at the problem! Awesome as usual. My husband and I so enjoy your blog posts. We wish you well with the publishing efforts, and that the process goes forward with “perfect timing.” Sometimes when things seem to be blocked it’s because things need to simmer a bit until everything is in order and ready to be served with the best possible results. We wish you well. This was another huge inspiration. And so true. On a smaller scale, I had worked for a long time on a play about Sappho, even went to Lesbos for part of the research. Got one act done and it was shot down in flames at a playwright’s workshop I attended. I was devastated and decided to shelve it. Today, an actress who wanted to read it called me. She’s doing some dramaturge work on it and loves it. While the workshop fasciliator had told me it was ‘unproducable’ but offered no solutions, she has given me lots. So as soon as I finish this last bit of my long novel, I plan to resume work on the play. Yes! listen to that trumpet call and forge on! Pressfield is my Yoda. Even Yoda crashes. Wow. But Yoda works the problem. Another lesson in the War of Art. Naaaa… I still Choose to believe that you have this writing thing wired. Just discovered your blog, thanks to a tweet from @ficwriter on twitter. I love how you admit that you forgot everything you knew from writing The War of Art. I think that happens to all of us, and that often writing and creativity is more a process of remembering than anything else–remembering what we know deep inside us, and remembering how we get ourselves planted in our chairs to write it. Your novel sounds amazing. If it is at all possible to tone it down with the military references that would make your message SO much more palatable to consume for me(and I suspect many others). aaaaarrrrrhhhh one more foot!!!!!!! (trumpet sound) wait that’s not our sign again……. Awesome, Steve, thanks a lot. Have been a fan of yours ever since I picked up GATES at the library over 10 yrs ago. Can’t wait for THE PROFESSION! Thank you for the story about Epaminondas and the trumpet. After writing, directing and producing an award-winning short film in late ’09, I have been unable to summon my creative energies to write anything new, and have increasingly found myself growing more bitter and frustrated. © 2017 Steven Pressfield. All Rights Reserved.